(Matthews, North Carolina) March 28, 2017 - CEM Corporation, a leading supplier of peptide synthesis solutions, is pleased to announce the introduction of the new Razor Peptide Cleavage System. This unique system utilizes elevated temperature for the peptide resin cleavage process to reduce reaction times at least 4- fold and promote more complete removal of side chain protecting groups, which is particularly useful for long peptides. The Razor cleaves up to 12 peptides in parallel in only 30 minutes making it ideal for both standard and highthroughput workflows. The system features a pre-cleavage washing station, a 12-position heating block with temperature control, and a collection tray with efficient, independent vacuum draining. 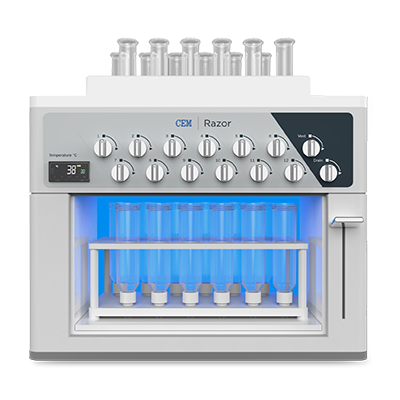 A compact design allows the Razor to easily fit in standard fume hoods, and the detached module protects peptide synthesizers from the corrosive effects of trifluoroacetic acid (TFA).